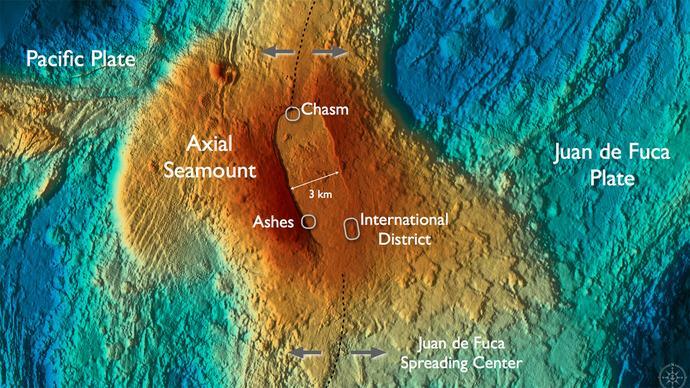 Dr. Kelley will focus on hydrothermal systems along the Juan de Fuca Ridge and the Lost City Hydrothermal Field that she helped discover in 2000. Lost City is a remarkable system with conditions never before seen in the marine environment including, limestone chimneys that rise over 180 feet above the surrounding seafloor. The field has been active for at least 150,000 years. Dr. Kelley’s work is made possible by extraordinary advances in marine monitoring technology including the National Science Foundation's Ocean Observatories Initiative (OOI) known as the Cabled Array. Dr. Kelley serves as the director for the underwater cabled component of the Cabled Array an innovative project that includes installation of ~900 km of high power and bandwidth fiber optic cables on the seafloor that are stream live, real-time data to shore providing new insights into submarine earthquake generation, ocean acidification, climate change, an active underwater volcano, methane seeps and life in the extreme environments of hydrothermal vents. This is the first of four presentations in Port Townsend Marine Science Center’s third annual Future of Oceans Lecture Series sponsored by the Darrow Family. THE 2016/17 FUTURE OF OCEANS LECTURE SERIES explores the frontiers of ocean research and emerging technologies as they confront the human capacity to know and sustain oceans.